Winyah Nursing Home has been around since 1965. As a haunting, it would be one place that I would put at the top of my list of the most haunted places in South Carolina and fighting for the number one spot. There’s a back hallway originally set up for employees and patients to travel between locations without going out into the “administrator‘s lobby.” If traveling from Station 1 to Station 2, there are no problems. But coming back from 2 to 1, many had a very distinct feeling of being followed. They’re only followed to the kitchen though (about half way) and then the feeling would go away. This feeling was so powerfully strong that many would stop and turn around to see who was trailing behind them. Footsteps can be heard all day and night long. Doors being open and shut, occasional phantom moans and groans. The noises tend to blend in with day time activity and are more prominent during the night only because it’s quieter then and can be heard more clearly. The administrator had to take down the mirror in the main lobby because so many people complained that while coming from 1st Station they’d see a woman with a bright yellow shirt with red flowers on it and when they looked back to greet her, no one would be there. It was determined “The Lady with the Yellow Shirt” was a past kitchen employee. Some reported seeing her walking from the hallway doors, as if she were going home for the night, toward the outside door. When they turned to look at her she would have vanished. “But Carl’s room is down at the end of the hall, the very last room. How can it be him if they’re coming closer to the desk and he‘s still in his room,” I said, pointing out the major flaw in what she was saying. Still, she refused to acknowledge Shirley. If the door rattled like it was being checked, Geralene would say it was windy outside (every night, several times a night, even on muggy nights). “Geralene, a firefly is creating more wind tonight with his wings than the weather is,” I’d say teasingly to her. “Not to me,” she’d declare and pull her sweater around her. Her sister, also an employee, would laugh but at the same time, refused to acknowledge what was going on. I’ve been in patient’s rooms and heard heavy, male footsteps march right up to me and stop. 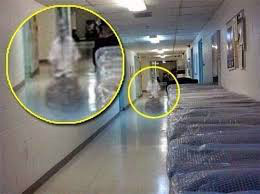 One night, feeling a bit hectic, I told whomever had just walked up to me, “Not tonight, I am in no mood to deal with ghosts!” Promptly, the footsteps turned and walked out of the room. “Put what back,” I asked her absently as I continued to collect my supplies. When she didn’t answer I looked behind me to find no one there. It was at that moment I remembered Agnes had died four nights earlier. While working 1st Station one night, Anne, a CNA who usually worked 2nd had just finished her rounds. “Great,” she says to me as I am charting. “Help you do what,” Barbara asked coming from around the corner to stand next to me at the desk. “Help me put that man to bed we forgot,” Anne answered with a chuckle. “The one sitting in the wheelchair …” Anne stopped and looked back at us. “Where did he go?” She then proceeded to walk to his room and back to the desk. “And none have come by here either,” I offered.